“Wu Xing”, translated as Five Elements is used extensively by many to describe & understand phases of interactions and relationships between different phenomena. “Wu” meaning Five, “Xing” meaning Elements or the “process of change” or “phases”. The Diagram and a more artistic version on the back of the cards represent the interactions between the Wu Xing or Five Elements. The “productive & absorbing” cycle is illustrated by blue arrows running clockwise. The “destructive” or “conquering” cycle is represented by red arrows inside the circle. 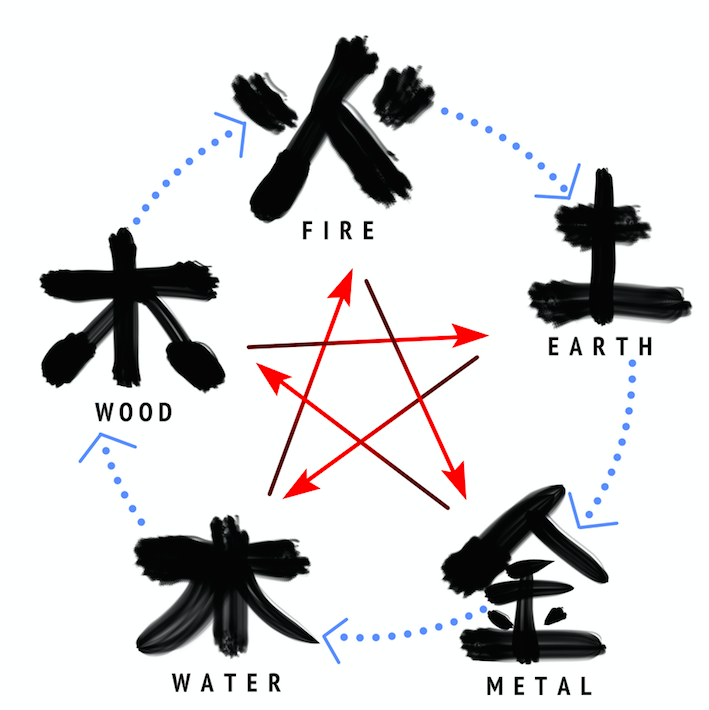 The “Five Elements” are Wood (木 mù), Fire (火 huǒ), Earth(土 tǔ), Metal (金 jīn), and Water (水 shuǐ). This Ancient system has been used as a reference in Feng shui, astrology, traditional Chinese medicine, music,military strategy, martial arts, politics.